These are the items in a normal daily lunch menu. On special occasions, festival days and marriage feast there will be sambar, kara kuzhambu or vatha kuzhambu, more kuzhambu, rasam, one vegetable stir fry, one or two spicy curry, two types of vegetable koottu, a sweet, payasam [ dessert ], vadai, banana, along with other regular ones. There is a specific way and order in which food has to be taken. To begin with white rice has to be mixed with salted lentil adding ghee. It has to be relished with thayir pachadi [ curd salad ] and vegetables of sambar. Next take some more white rice and add sambar liberally adding little ghee or gingelly oil [ till/sesame oil ]. Have along with curry and koottu. You can also enjoy with pappad and vathal. Now comes rasam. Take hot white rice and pour rasam over it. Mix well and enjoy with curry, koottu and pappad/vathal. If payasam [ dessert ] is in the menu, then have at this point. Finally mix white rice with curd or buttermilk and have with pickle. Please find links below for posts related to the recipes of lunch. I keep adding links whenever a new post is published in this blog. Links to various lunch menus are tabulated here. 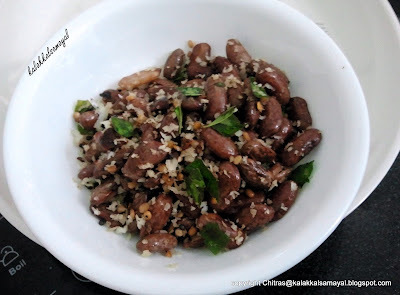 Use the pictures grid given below to go to posts of Legume stir fry [ Sundal ]. Hover cursor over the picture to know the name of the recipe. Click on the picture to take you to the recipe.